The real power in using Heads Up Health with Keto-Mojo is being able to track and correlate biomarkers you care about, such as the GKI (Glucose Ketone Index) with other major health metrics, like body measurements. 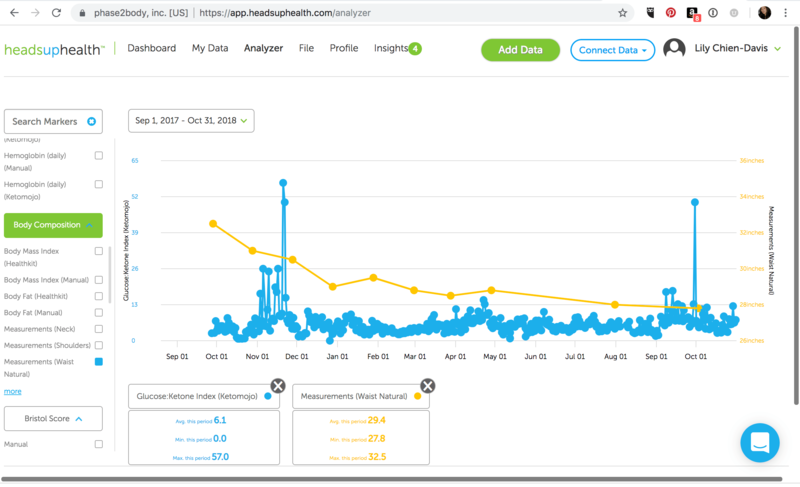 The leader in consumer software for personal health data analytics, Heads Up Health allows you to see your progress over weeks, month, years — all in one place. When used together with Keto-Mojo, the leader in affordable, accurate blood glucose and ketone testing meters, they’re a powerful force for helping you get into ketosis, maintain keto-adaptation, and see the big picture of your metabolic health and body composition. 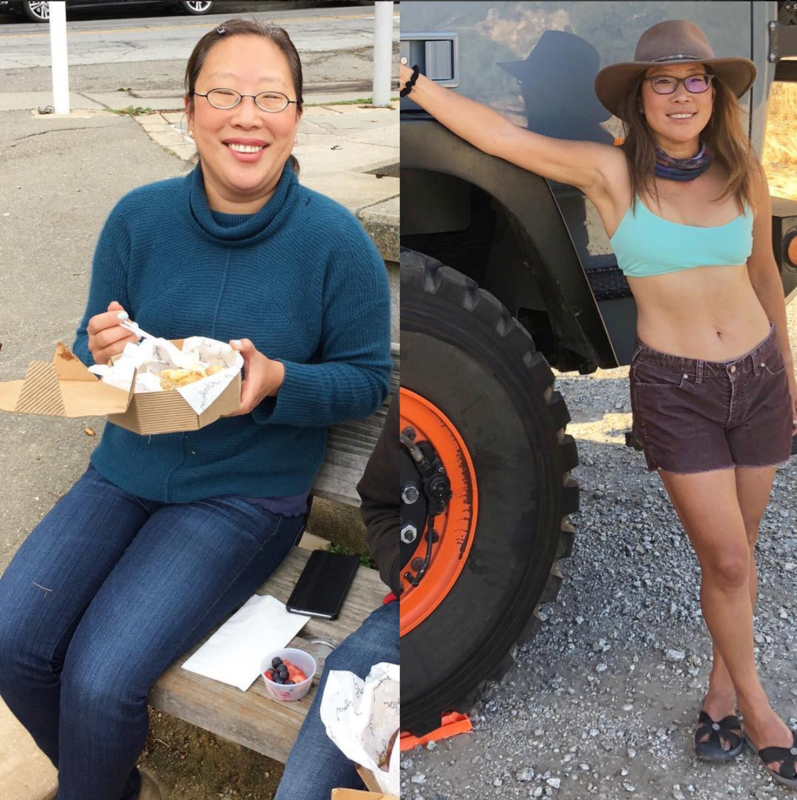 For example, our Social Media Manager, and avid Heads Up Health user, Lily Chien-Davis, correlated her GKI with her waist circumference measurements, whittling down her waist size while staying keto-adapted. In the graph above, Lily shares how she used Keto-Mojo to track her glucose and ketones over the past 12 months, uploading those results to Heads Up Health where we automatically calculate the glucose-ketone index (GKI), a powerful biomarker for tracking your metabolic health. The graph speaks for itself as Lily slashed over five inches off her waist circumference! As they both carefully monitored his glucose ketone index and watched his tumors rapidly shrink, she began eating keto too, surprised, as someone diagnosed with pre-diabetes, to watch her own HbA1c go down, from 5.9% to 5.2%. In 2016, she discovered Heads Up Health while listening to keto podcasts (i.e., Jimmy Moore, Ketovangelist, 2 Keto Dudes). Both she and her husband immediately signed up, excited to track their glucose, ketones, and GKI alongside their medical records and body composition data, such as weight and waist size. Since then, Lily has never looked back. Instead of using a scale to track her weight every day, which can be maddening because weight loss is never linear, she tracks her GKI alongside her waist circumference and weight once a month using our measurements feature. In the beginning she also tracked her macros, but now relies solely on eating an intuitive keto-paleo and sometimes carnivore diet, preferring to track her GKI regularly, using the graphing feature in Heads Up Health’s Analyzer to reflect on her progress, helping her stay motivated. Here’s Lily’s before/after photos and you can see how great she looks. Most importantly, she FEELS awesome, both mentally and physically. It takes a lot of courage to share this information so please give Lily a shout-out on Instagram (@hellbentonbliss). We love you Lily! Ready to get started? Enter your first set of baseline measurements, get yourself into nutritional ketosis and track your success! We’ve included a little video tutorial below to help you get started.